One thing about me that is good to know is that I appreciate odd things. What does “odd” mean you might ask? Well, like all words there are various shades of grey (but not 50). When I say I like odd things, it covers a broad spectrum. From the truly odd stuff, to the not-so-odd stuff that might seem mundane to most people but really matters to me. Today’s post is an example of the later. When it comes to scissors a lot of people, with the exception of those who do lots of fabric work or the like, probably don’t care a whole lot. Sure, no one likes those crappy little safety scissors that disfigured my hands as a child. But as long as they are not overly painful and cut marginally, its not something you probably think about a whole lot. Not me. You see, scissors have ONE JERB, and as with any item that has ONE JERB, I want it to work. For instance, I had a spray bottle that sometimes wouldn’t spray properly. So I bought another spray bottle and poured the window cleaner from the sometimes faulty bottle into the new bottle. It just needs to work. Scissors are no different. Many, many moons ago SB and I went to the store (Wal-Mart) and bought a double pack of standard scissors [They are the blue and black scissors on the left in the photo below]. These scissors did ok, they cut stuff. However over time they started to acquire nastiness from tape and other various things. We cleaned them, then the stainless Wal-Mart steel started to rust. But we kept putting up with them, because scissors. Eventually a generic black pair of scissors [Right Side] joined the fray. Or rather rejoined the fray, as Meem bought these for me in 2005 then they were lost for nearly a decade in the abyss of her garage. These black scissors weren’t gunky (yet) but they did not cut well and hurt my dainty fingers. But life went on, despite our epic first world scissor struggles. But then we decided to go to graduate school. That, is when things got real. No longer complacent in my scissor suffering I took to the interwebs to find good scissors, since I was sophisticated now. I really researched this, I kid you not (which is probably no surprise, if you know me). 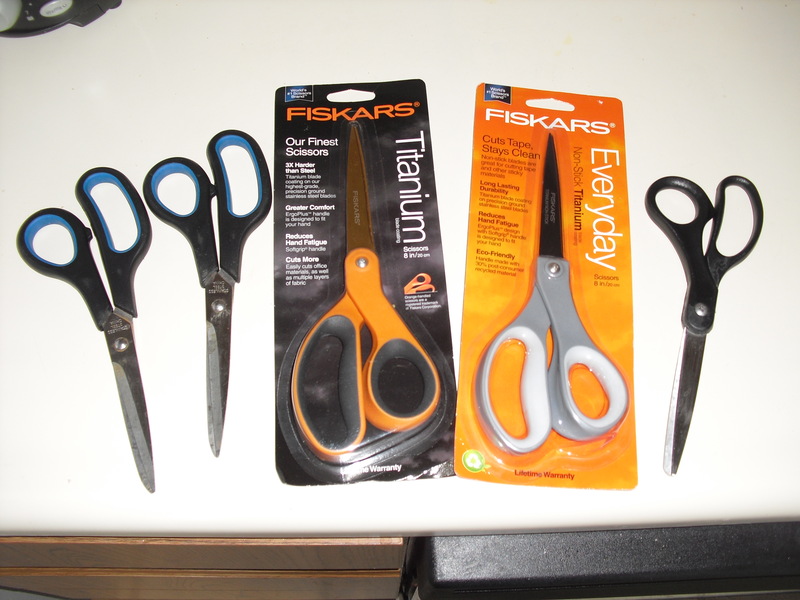 I ended up going with Fiskars, who you scissor neophytes may or may not know. 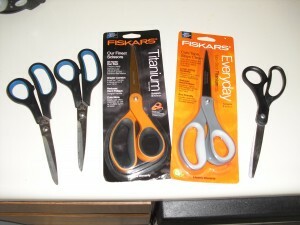 However, I didn’t stop with just the standard orange handle Fiskars, oh no, I went with TITANIUM SCISSORS. Yes, TITANIUM FREAKING SCISSORS. Furthermore, frustrated with tape gunk, I bought one pair of TITANIUM SCISSORS with anti-stick coating, just for tape. They both have lifetime warranties. The “standard” pair of TITANIUM SCISSORS is ultra sharp, so much so that when I cut a piece of paper with them I split atoms and created a black hole in my kitchen. The non-stick pair are not quite as sharp, but if you put super glue on them it evaporates in their glory. So yes, you jelly, oh so jelly, of mah scissors. P.S. – As an update to this, the new scissors can cut carpet. Yiss.